Developing the highest potential in every player. The only golf academy in Georgia with a boarding component, Coosa Junior Golf Academy at Darlington School develops the highest potential in every player by integrating a strong academic curriculum, state-of-the-art athletic facilities, and professional instruction on the course. Become the golfer you were meant to be. Our staff of certified coaches and performance training specialists have designed a training regimen that combines solid fundamentals with clear communication and state-of-the-art digital video analysis technology to ensure all players advance their game. This dedicated team of coaches is also committed to mapping out college recruitment strategies that fit each athlete’s unique academic and athletic abilities. The Golf Academy has established relationships with the Georgia PGA Junior Golf Tour, the Hurricane Golf Tour and the Southeastern Junior Golf Tour. Based on their individual level of play, golfers have year-round opportunities to compete in events hosted by these entities as well as the American Junior Golf Association. I have a passion for the game of golf and working with student-athletes, and I love sharing my knowledge with the Academy golfers. We build on strengths and discover areas of improvement all while learning life lessons through the sport. I want everyone to have a first-rate experience while also having some fun along the way. Elite golf training along the banks of the Coosa River. Darlington's Golf Academy trains at Coosa Country Club which boasts a beautiful eighteen-hole championship golf course set alongside the Coosa River and in close proximity to campus. Coosa Country Club provides a classic country club setting that prides itself in the history and tradition of this great game. Who can participate in Coosa Junior Golf Academy? The Golf Academy enrolls highly motivated male and female student-athletes who share a common goal – to obtain a premier college-preparatory education and professional golf training within a single, competitive program. Both boarding and day students may participate in the program. Fees include practice balls, fittings, cart use, assessments, coaching, uniforms, transportation to/from Coosa Country Club, golf bags or travel bag, and related training activities. Tournament entry fees are not included. How often does the Golf Academy train? Student-athletes in grades 6-8 train Tuesday through Friday from 3 to 4 p.m., while student-athletes in grades 9-12 train Monday through Friday from 4 to 6:15 p.m. Optional weekend training and practice play may be scheduled with transportation provided. Participants train at Coosa Country Club, which is approximately five minutes from the Darlington School campus. The 18-hole course with Bermuda fairways and Bent grass greens winds along the banks of the Coosa River, providing a rewarding game for players of all skill levels. All swing training takes place at Coosa Country Club’s Golf Academy Learning Center. Short game training takes place at the designated Short Game Practice Facility and/or the Practice Putting Green at Coosa Country Club. As any Darlington student does, players have complete access to the Huffman Memorial Athletic Center, a 96,000-square-foot facility with a natatorium, indoor track, weight room, swimming pool, and four multi-purpose courts. What is the Golf Academy’s training philosophy? Our goal is to provide the highest quality golf instruction and learning atmosphere, while creating a productive environment. Character development, skill improvement and a competitive, attitude-driven training ambience are qualities that our staff professionals adhere to. What is a typical training session like? Training includes warm up and cool down stretching, competitive pressure drills, video stroke analysis, mental toughness sessions, and private lessons in addition to group training. 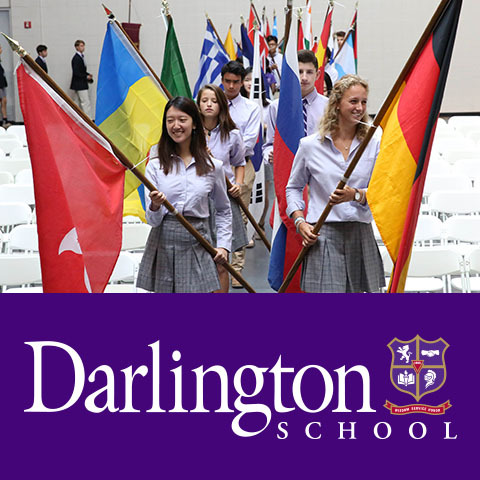 All Darlington students are supported by the school’s full-time college guidance staff and their resources. The Coosa Junior Golf Academy staff also contact college coaches directly; tracks grades and extracurricular activities; and reviews videos and player profiles so that these items can be shared with the schools in which the player is interested. How does the Golf Academy help players achieve success? Coosa Junior Golf Academy’s specialized training program paired with Darlington’s rigorous college-preparatory offerings push each member to reach his or her potential – whether that is to play recreationally, or to strive for the college game or beyond. Participants train throughout the school year with highly qualified coaches and have numerous opportunities to compete both locally and regionally. Where do boarding students who enroll in the Golf Academy live?